Bike path on I-205 between Portland, OR. and Vancouver, WA. Dancing to the beat of the suburbs. 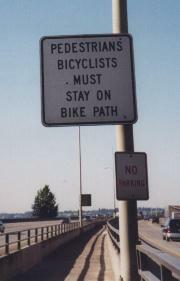 Pedestrians and bicycles must stay on path - duh. Step over the rail and get smashed, like an ant, by 2 18 wheeler tractor trailers roaring 2, or more, abreast on the multi lane freeway. One really feels the power of the traffic, even though it is safe behind the strong concrete and steel barriers. 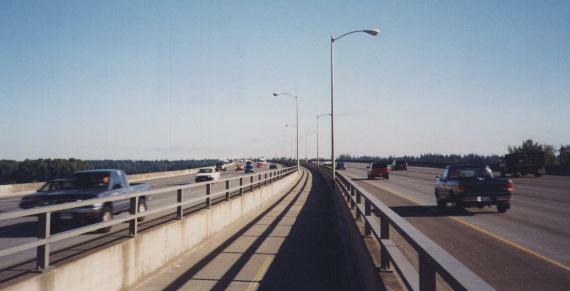 Riding along the path in the middle of the bridge as 8 lanes of cars and trucks zoom on by. Look up and a big jet is burning its fuel overhead as it makes an approach to the Portland International Airport. It is definitely a world where everyone is "on the move." 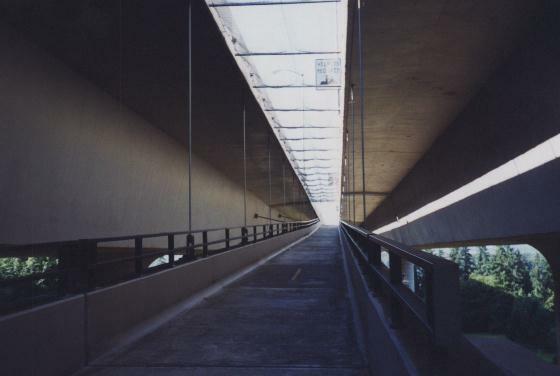 On the Vancouver side, the bike path drops down between the north and south bound sections of I-205. One feels like an ant between the cracks of a sidewalk, or a human living in a world of Paul Bunyans. After the bridge, the bike path dumps one out into a world of suburban sprawl. Asphalt and cars going every which way. Of course, a shopping mall with hardly a sign of natural plant life except a few hardy weeds trying to creep up through cracks in the pavement. I stepped into a glass cube. It was a stop-n-shop type mart. Everyone was zipping in and out like aliens of a foreign world. I stood in the fast moving line and paid for my cola; could have been a "Jolt Cola." Then I sat on the oil stained pavement, with the smell of gasoline from the pump island in the air, and drank that cola. Looking across the mall, one could see bold plastic letters spelling out the name "PETCO." I remembered ads on the radio for that chain of stores offering everything for your pooch. Yes, in suburban America even the animal world can be extruded from the same corporate machine that cranks out large beams for the bridge and keeps everyone, in sight, moving along. The animal kingdom managed by Petco, a division of conglomerate? Oil refineries or something? The Petco process? How about the refinery's cracker unit? Animal crackers? Find them at the AM / PM also. Bi-Mart? How about "Buy-more."